My obsession with names prompted me to look into the long list of kids claimed by The Simpsons characters Cletus and Brandine Spuckler. Zoe, pronounced to rhyme with "blow"
Chloe, also pronounced to rhyme with "blow"
A kid whom Brandine births and for whom she asks Cletus to "cut the umbrellical cord"
Children described in "Marge Gamer" by Cletus with the following sentence: "I have sired a dumb-dumb, a mush-head, a whatsit, a dogboy, and something with a human face and fish body what we called Kevin. But my young'uns is not dirty players!" And, finally, in "Apocalypse Cow," two more — Marry Westlemania Spuckler and Stabbed in Jail Spuckler. 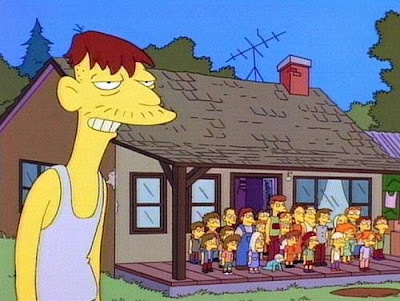 So, then, if you only count two from "Yokel Cords" and suppose that the ones named in "Marge Gamer" as being kids already listed, Cletus has 36 strikingly named children. But you're counting the Kevin the Fishboy as one, right? You're not lumping all the described kids as being previously listed? you are defenaly wrong and you are poo!! and very nasty i feel sorry for the skunk so HAAAAAAAAAAAAAAAAAAAAAAAAAAAAAAAAAAAAAAAA!!!!!!!!!!!!!! Anonymous: You have my permission to never come back.